Background Info: My house is all electric. Last month when I got my electric bill, I flipped. It was triple that of any month prior. Now I know the cold (heating) can affect this so I decided to turn my thermostat back, even though I never had to before. I've finally got the results back and to my surprise, it's still pretty darn high (but somewhat lower thankfully). The head-scratcher is that not only did I turn my thermostat down 4-6 degrees, it also hasn't been very cold here lately. It has ran a fraction of what it did the month prior, and that's just from the ambient temp difference. This isn't considering the fact that the thermostat is off for half of the day while I'm at work. I also wouldn't deem my system extremely inefficient, as I have a heat pump. Anyways, so I'm suspecting there's something else at play here. Perhaps another large appliance like the washer/dryer, dishwasher, hot water heater, etc. However, I do not know how to troubleshoot this or determine how much energy any one appliance is using. Are there any pro-tips or easy/cheap ways that I can measure, or at least get a general idea, of which appliance in my house could be causing such high energy usage? I've seen before meters that you plug into the wall (in-between the socket and appliance), but I imagine those are not the most inexpensive route to take. I was wondering if maybe I could see the real-time load for the entire house? Like at the meter, and then I could one-by-one disconnect appliances and notate the fluctuations in total usage. Anything like that would be great, or if you have better ideas, please share! Quick Note: I recently had someone move into one of my spare rooms. One of my suspicions that I'm looking to verify is that they take extra long showers and overwork my hot water heater. I mainly suspect this because they mentioned that they ran out of hot water, something that has never happened to me before. I wouldn't be concerned if I was still considered "efficient" by my electric company, but as you can see, I went from being relatively efficient to not even close. UPDATE 3/3/2018 After doing some testing, I've come to realize that my heat pump isn't putting out any heat at all. So basically, I have been running off AUX heat exclusively. That combined with how cold it has been may very well explain the large spike in usage. I called a tech to come look at it. I will update and close this question once it has been verified. UPDATE 12/10/2018 It has been a while so I thought I would share with everyone what the real issue was. After a few visits, it was finally discovered that my heat coils were stuck on. Even with the thermostat off, they were getting constant power. You could actually feel the heat radiating from the floor above the coils (they're in a crawl space). I'm lucky they found it, otherwise I could've had a fire on my hands. So yes, in essence, my AUX heat was running 24/7 for what was likely a month or two. CRAZY! Since you say your backup heat is electric, I'd say that's what is using all the power. It could be that the weather is unseasonably cold and that the backup emergency heat is kicking in often. Your Nest Thermostat could be switching to AUX heat more often than your old thermostat would have. Since you say your nest thermostat is new (last summer), It is likely that it is responsible for kicking on the aux (emergency) electric heat more often than your old thermostat. There are settings to change how often this happens described below. Your Nest thermostat may calling for aux heat more often than your old one would have. This can be configured with Heat Pump Balance which you might try changing to Max Savings or balanced. Note that the link below states that Max Comfort, the most expensive option, is selected by default. This is probably the issue. If changing this doesn't help, then I'd call an HVAC specialist. Because auxiliary heat is so expensive, running the heat pump longer is still cheaper than using AUX heat. Heat Pump Balance automatically turns the heat on early to reduce AUX heat use as much as possible and get to your target temperature on time. It can turn on the heat up to 5 hours before a scheduled temperature if necessary. So if your schedule says 70ºF/20ºC at 7pm, Heat Pump Balance can use Early-On technology to start heating as early as 2pm. Max Savings - This is the best setting for saving energy. In Max Savings mode, the Nest thermostat gives the heat pump more time to get to your target temperature before turning on AUX and sets a lower AUX lockout temp. Balanced - This setting will give the heat pump more time to work, but will still turn AUX on quickly if it looks like it won't get you to your target temperature on time. Balanced has an AUX lockout temp somewhere between Max Comfort and Max Savings. Max Comfort - When you choose Max Comfort, the Nest thermostat will make sure you'll get to the temperature you want, even if it means using auxiliary heat. Max Comfort is the default setting for Heat Pump Balance and generally gives you a higher AUX lockout temp. Off - You can also turn Heat Pump Balance off entirely and adjust your AUX lockout temperature yourself. The AUX lockout temperature can be changed in SETTINGS > EQUIPMENT > HEAT PUMP. There might be something wrong with your heat pump. It could also be that there is something wrong with your heat pump. IE, it is running and using some energy but not generating any heat. Eventually, this will lead to the thermostat switching on the emergency electric heat and that will use even more power. Call an hvac specialist and have it inspected. Do you have average temperature data for your area, so you can verify that it hasn't been "that cold". You didn't purchase any new electronics such as bitcoin miners with the latest craze did you? Have any close neighbors? Cheapest thing if you have no electrical test equipment: go to the meter, on a lot of them you can see the least significant digit moving. Get a stop watch and time how long it takes to move 1 digit or however many you can easily decipher. Go to your circuit breaker and switch off one circuit at a time, starting with the biggest appliances. Go back to the meter and retest the time it takes to move however many digits. Turn the circuit back on and turn another off, repeat for all the major appliances and see which is drawing the most power. I would suspect (assuming you turn off your HVAC most of the day): water heater top of the list, HVAC second. Dishwasher, stove, oven, microwave, also pull large amounts of energy but don't tend to be continuous and unnoticed. Mid-December through January were brutal in the midwest. Most days and nearly every night were below 10F. Normal heat pumps cannot work at such low temperatures. The heat pump was failing over to "emergency heat"
This is just a big bank of electrical resistors. I have seen installations where these resistors were on dual 70A breakers and ran well over 24kw - at common electric prices, that's $3/hour. This wasn't your problem. But watch out for emergency heat incorrectly configured as "auxiliary heat" on the thermostat. The 'stat will call for that whenever it needs to speed up house heating a little bit, e.g. When warming it for your arrival back home. It presumes main and aux heat cost about the same or that you don't care. However the 'stat has no idea when the heat pump is too cold to work. The heat pump knows and it should call for emerency heat only when it cannot work IMO. Disclaimer: I am located in central europe, so this may or may not apply for you. In our region, typically every energy company and several environmental NGOs offer a service to borrow an energy meter for free or with a very small fee. Like this one: https://www.swm.de/privatkunden/kundenservice/energieberatung/strommesskoffer.html (it's in german, but just have a look at the pictures) Usual procedure is, you write to them and they give you date and time to pick up the equipment, and a week or two later you return the stuff. There are meters for usual plugs, but there are also clamp-on-meters, which allow you to measure power consumption of directly wired appliances (e.g. if you suspect your ceiling light to run a server cluster up there). IMHO this is the simplest, cheapest and most accurate way of having a power consumption survey in your home. In a LOT of cases I've seen like this, it's turns out a problem with your water heater, assuming that if you have electric heat, you likely have an electric water heater. If the element is damaged, it leaks current into the water and immediately to ground, but because it's a high resistance ground fault, the breaker never trips. The fault in the element decreases the efficiency, so it almost never shuts off as it struggles to keep up with your hot water demand. You may not notice it in the hot water though, just in the high power consumption. Have an electrician check it for you. When heating a house, you don't pay directly for the temperature inside the house. You pay for the heat that gets away from your house. Dialing the thermostat down works because smaller temperature difference means slower heat transfer. On the other hand, increasing insulation gets higher temperatures at same cost. If that new person enjoys fresh air and is keeping a window cracked open, or doesn't understand how thermostat works and instead of dialing it down opens the window, the thermostat will try to maintain the temp and this process can burn absurd amount of energy, as you're basically trying to heat up the world outside through the open window. I suspect the new person here, but damaged/removed insulation will yield same reason - when the heat is escaping, the thermostat will run heaters 24/7. You should look for heat escape routes. I was wondering if maybe I could see the real-time load for the entire house? Like at the meter, and then I could one-by-one disconnect appliances and notate the fluctuations in total usage. Then just look at your meter. The old ones have a spinning wheel, and the new ones have a blinking light. The faster it goes, the higher the energy consumption. For rough estimation, just looking at it helps, if you want exact numbers then you start counting - factor should be written on the meter, eg mine says "6400 pulses per kWh". However, I believe that this is a dead end. If you haven't brought any new appliances into the house, the problem is most likely an old appliance that now works much more than it did earlier. What you want to monitor is appliance usage. It can be a simple sheet of paper when people log usage next to washing machine, etc. But that data is not easy to analyze without old data - just as you suspect more water heater use now, but you don't have historic water heater data. However, take a look at your old water bills - increase in water usage should be roughly proportional to water heater usage. While the heat pump / HVAC is a very likely culprit and should be checked out first, it is possible that this is a combination of seasonal variations and the new roommate. Looking at your graph, I'm guessing your roommate moved in sometime in November, as that's when your usage started exceeding that of your neighbors. 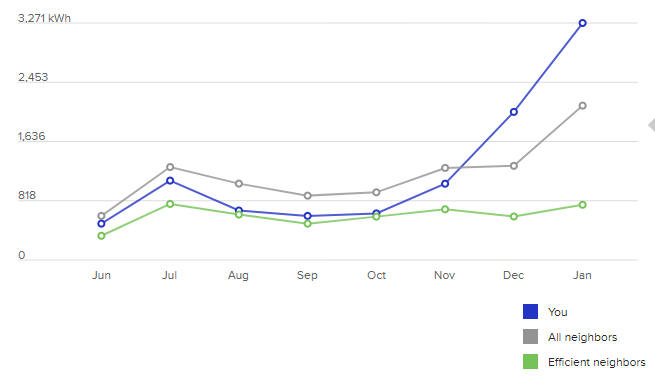 Also, taking your neighbors' usage to be typical for your area and the season, you used an extra ~1300 kWh than they did in Jan (~800 kWh extra in Dec). Let's see if we can explain that away due to the roommate. This means you were using ~70-100 kWh per month to heat your water before the roommate. If your roommate likes long hot showers (and they very well might if they're not responsible for any of the electric bill! ), though, that usage could more than double, so maybe it's an additional 150-200 kWh because of them. Any increase here should be readily apparent on your water bill, too. Your roommate also does laundry and dishes, cooks, etc. Maybe you eat together, or combine dishes into a single run of the dishwasher, so this isn't exactly double your previous usage. Call it 1.5x though. 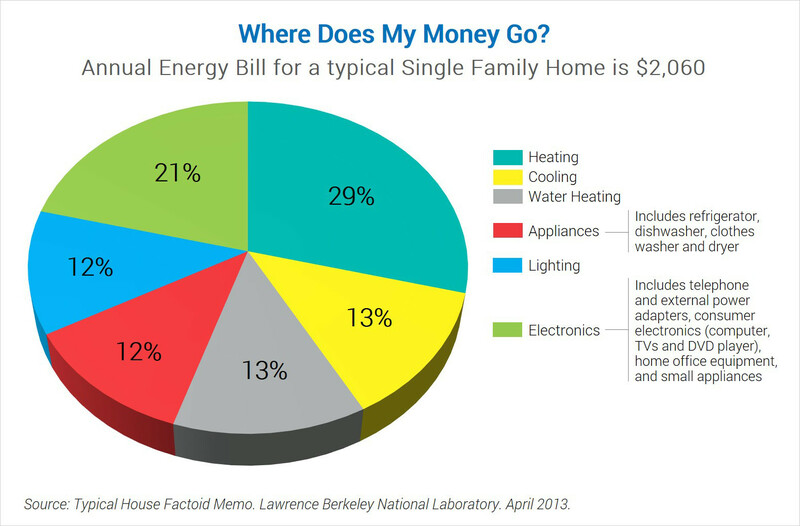 Appliances tend to be another 10-15% of your electric bill (~70-100 kWh), so this could add an additional 35-50 kWh. That's 200-250 kWh extra total. I assume your roommate has a computer, which is probably on all of the time. Even a low-powered one would consume ~70 kWh / month, but if they have a big machine and have it under load most of the time (maybe running Seti@Home, or another @Home project, maybe just gaming a lot at night, or maybe they're cryptomining), this could hit 500 kWh per month. That's 700-750 kWh extra total. Add in some extra lights being on, maybe a TV in their room, device chargers, etc and that could be an additional 100 kWh a month or more. Total is now 800-850 kWh extra. That explains your December usage right there, though we're still a bit short on January usage. Maybe that is emergency heat, additional water heater losses due to extreme cold, etc, or it could be that our estimates were off. As I said, this is not necessarily "normal" usage, but that it could be explained by non-broken things. You, and all answers, seem to focus on the fairly obvious high energy consumer - water heater. You mentioned that you recently got a lodger in your spare room. How well do you know what they do in their room? A colleague of mine recently discussed how his energy bill tripled from one month to the next - all thanks to an average-sized bitcoin mining rig. These are (usually) very specialised computers that are very fast and very powerful - and as a result use a lot of energy. He calculated his actual usage increased by roughly 1,000 kWh per month. I'm not necessarily suggesting that this is what is going on, but it's worth checking. You mention that your roomer has a TV and a game console. Large format LED/LCD flat screen TVs, despite the sales hype about being "energy efficient" are actually consuming a LOT of power. I have a 45" LED "Eco" model, it consumes 1.5kW (1500W) when it's on. That's like running a hair drier non-stop, or three 500W flood lights. Then even when it is off it is still consuming 50W continuously (hot standby mode). On top of that, a lot of gamers will pause a game so as to not lose their progress, then just get up and walk away, leaving the TV on 24/7. When my gamer son moved out, my power bill dropped by 50%! You can tell relative power usage of a circuit by the temperature of the circuit breaker protecting it. Feel them and see if any are noticeably warm. You could also use an ir thermometer to check them more accurately. If you suspect a particular appliance that plugs into the wall, I suggest using a Kill-a-Watt. It can measure instantaneous power draw as well as aggregate energy usage. It's pretty cheap, less than $30. Since you say your house is entirely electric, I imagine your water heater runs off electricity, but it may be wired directly without a plug. There's another device on the market called Sense (http://sense.com) that works for all electricity usage at your home since it measures right at your breaker box. The product claims to tell you what appliances (based on the way they draw power) are on and when they are on down to the second. I've been interested, but it is $299 at the time of this writing, but I would think that is the ultimate, if pricey solution. You might be interested in buying an Efergy Elite 4.0 Wireless Electricity Monitor. They cost about $100. I used mine for about three years until I had measured and recorded the KWH on most of the circuits in the house. It helped me to clearly understand that the main KWH users were heat, AC, and hot water heater. It led me to upgrade our AC/heater (Split Unit), add attic insulation, install an attic fan, insulate attic stairs, and other things and was able to prove it was saving money with before and after KWH consumption history. You use it at the circuit breaker panel; but, you have to be comfortable taking the cover off and connecting the meter clamp over the internal wires. It has a sending unit that you mount beside the panel, and a receiving unit you can place where you want. It also keeps daily KWH usage for about a week. I kept records in an Excel spreadsheet over a few weeks per circuit. Haven't used it in a couple of years now, but will if I start suspecting unusual usage. Oh, one more thing, it can measure 240v as well as 120v circuits. If you have an idea of what appliance might be causing the issue, you can use a device called kill-a-watt to measure the power draw. Not the answer you're looking for? Browse other questions tagged electrical energy-efficiency energy or ask your own question. How best can I discover what is up with my electrical bill? How much energy will continuously running a furnace fan use? What effect does the number of coil turns on an electric stove heating element have? Why don't heat pumps run for a bit BEFORE starting the air circulation fan?